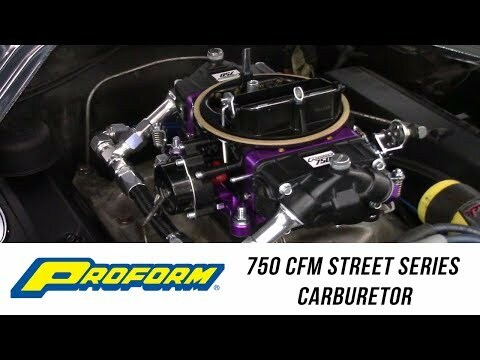 PROFORM's new Street Series Carburetors are hand assembled in the U.S. Based on the wildly successful Race Series carburetors the new PROFORM street carburetors. Constructed of light weight aluminum, changeable idle air bleeds for easy non-permanent calibration changes if needed. Fine tuning is accomplished by simply changing air bleeds not opening calibration restrictions with a drill bit. Each street carburetor features billet metering blocks with a street performance calibration developed for today's high performance engines. Four corner idle on mechanical secondary carburetor to help fine tune the idle with aggressive camshaft profile. Changeable idle feed restrictions expand the idle adjustment capabilities. Conventional service and tuning components are available in most performance retail outlets. Also the billet throttle body for superior strength, coupled with precision throttle shafts to ensure long term performance. All PROFORM carburetors have easy access adjustable secondary air flow. Others require special tools or removal of the carburetor to accomplish this simple adjustment. Complete with high quality, light weight die-cast aluminum fuel bowls with fuel level windows for quick reference. Float level changes do not require removal of a sight plug with the risk of fuel spilling. Bowls come equipped with 3/8in inverted flare fuel inlet fittings and will accept all conventional dual feed fuel lines compatible with Holley four barrel carburetors. Like all PROFORM carburetors, service parts are readily available however, should you not find PROFORM service parts, our carburetors are compatible with any modular carburetor service parts available at a local parts store or retail outlet. Please Note: when this model originally released it did not include a secondary metering block, but instead had a metering plate, which is not visible from the exterior. Our current model includes two metering blocks, so please check with your retailer before purchasing.